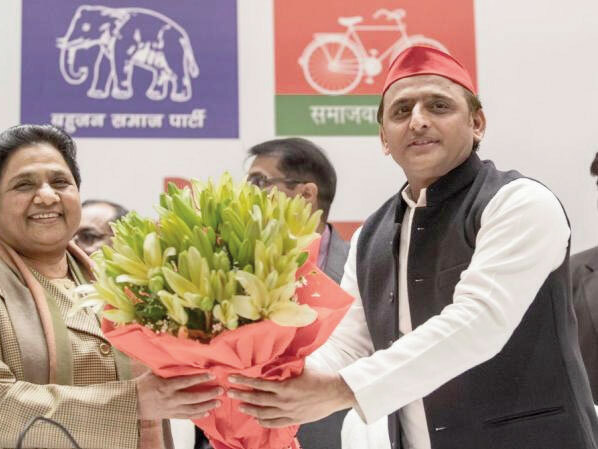 Mayawati and Akhilesh Yadav With the bugle for the 2019 Lok Sabha elections having been v i r t u a l l y sounded by political parties getting busy with finalising their poll strategy, a close watch needs to be kept on what goes on in UP, which, being the country's most populous state, sends 80 MPs to Parliament's Lower House. 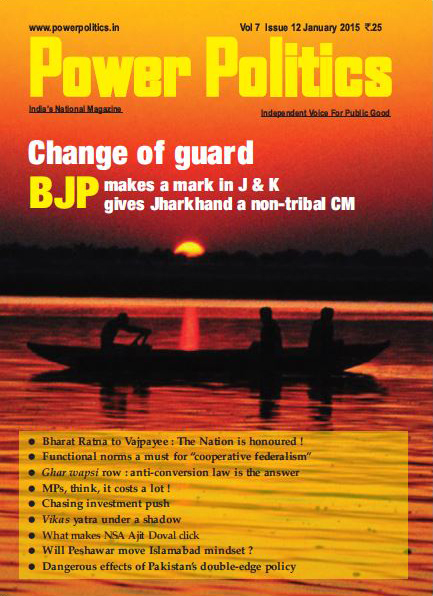 The two most important developments that have been commented upon extensively are the induction of Rahul Gandhi's sister (younger to him) Priyanka Gandhi Vadra into the Congress as the party's general secretary in UP (East) and the alliance forged between the Akhilesh Yadav-led Samajwadi Party (SP), the Mayawati-led Bahujan Samaj Party (BSP) and Chaudhary Ajit Singh's Rashtriya Lok Dal (RLD). Mayawati and Akhilesh Yadav The much thought-out decision to bring in the Priyanka factor to boost the morale of the Congress rank and file in UP has obviously been finalised after the party having been ignored by the SP and BSP leaderships while announcing their political deal, declaring that the country's grand oldest party was of little consequence in the politically most significant state. The Bua-Bhatija duo now needs to give a fresh thought to their decision to right off the Congress after it has used its trump card. The BJP too is bound to get alerted after Priyanka having formally plunged into politics. The SP and the BSP have agreed to fight together for 38 seats each with two going to the RLD and two having been left for the Congress. 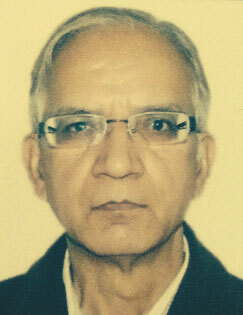 The two most important developments that have been commented upon extensively are the induction of Rahul Gandhi's sister (younger to him) Priyanka Gandhi Vadra into the Congress as the party's general secretary in UP (East) and the alliance forged between the Akhilesh Yadav-led Samajwadi Party (SP), the Mayawati-led Bahujan Samaj Party (BSP) and Chaudhary Ajit Singh's Rashtriya Lok Dal (RLD). The alliance has declared that it will not field its candidates in the Amethi and Rae Bareli constituencies represented by Congress president Rahul Gandhi and NDA chairperson Sonia Gandhi respectively. But this is not enough. 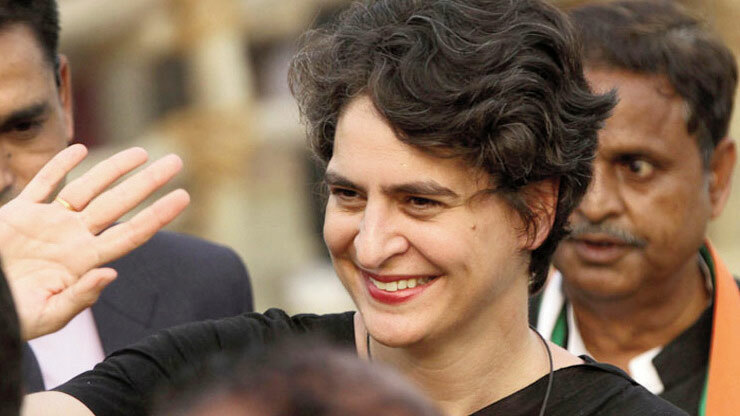 Priyanka's formal plunge into politics may change the rules of the political game, upsetting the calculations of not only the Bua-Bhatija due but also of the saffron camp, mainly depending on the Modi magic. 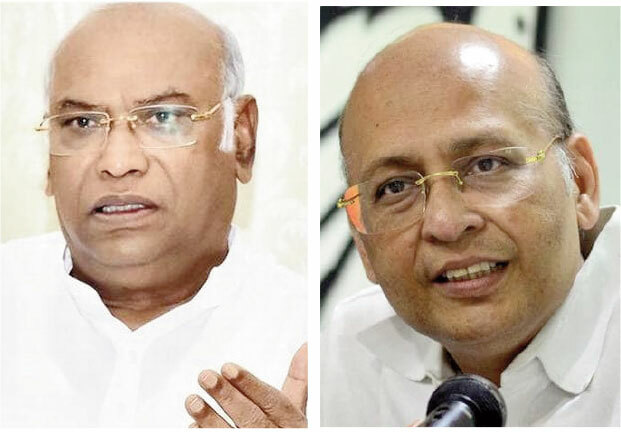 Mallikarjun Kharge and Abhishek Manu Singhvi In any case, the developments in UP cannot be described as a threat to the larger opposition move for a Mahagathbandhan to defeat the BJP in the coming parliamentary polls after what was witnessed in Kolkata a few days back. Over 20 parties, including the Congress and the Aam Aadmi Party, sent their representatives to the Kolkata Brigade Parade Ground "United India" rally organised by the Mamata Banerjee-led Trinamool Congress to prepare a roadmap for a grand coalition against the BJPled NDA. The Congress party's Mallikarjun Kharge and Abhishek Manu Singhvi could be seen sharing the dais with the SP's Akhilesh Yadav, AAP's Arvind Kejriwal and the BJP's former ministers Yashwant Sinha, Shatrughan Sinha and Arun Shourie. This shows that the Congress has been kept out of the SP-BSP-RLD alliance as part of a strategy to reduce the chances of the BJP repeating its 2014 performance when it won 72 of UP's 80 parliamentary seats. 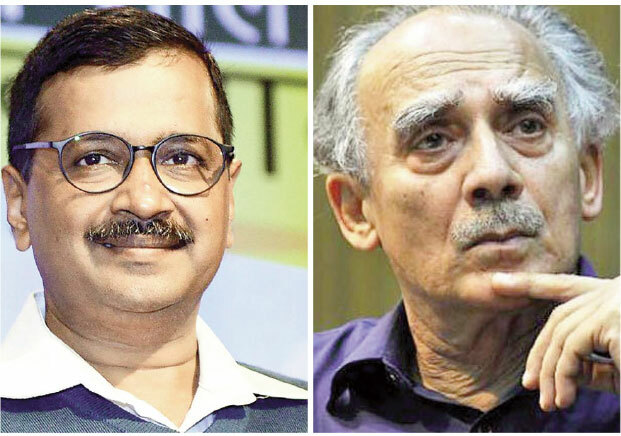 Arvind Kejriwal and Arun Shourie The Congress had no choice better than what it did on January 13, a day after the final seal of approval was put on the UP opposition alliance. The Congress announced that it would contest all the seats in UP and alone, which is going to transform the political battle into a three-corned contest with Priyanka as a charismatic Nehru-Gandhi scion playing a major role from the Congress side. According to one calculation, the Congress can wean away from the BJP not only its disgruntled upper caste supporters, particularly Brahmins and Thakurs --- who had earlier been supporting it and wish to punish the saffron party for its various policy failures --- but also a large number of women and youth voters. At the same time, the Congress remaining away from the opposition alliance may provide an alternative to sections in the OBCs not happy with the Yadavdominated SP and some disgruntled Scheduled Caste and Muslim voters to extend their support to the Congress to prevent the BJP from recapturing power at the Centre. 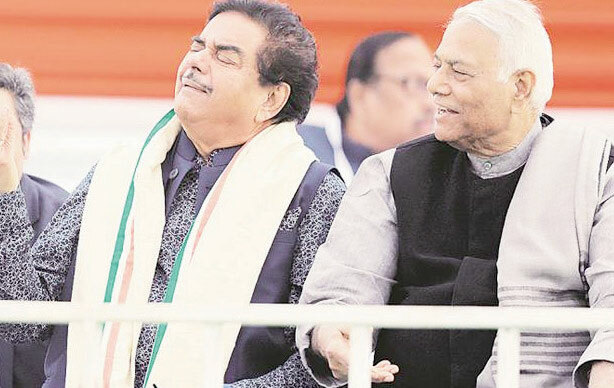 Shatrughan Sinha with Yashwant Sinha at the rally With Priyanka being at the helm of affairs in eastern UP, the Congress can hope to substantially increase its vote share from around 12 per cent which it has been getting during the elections for past few years. Going by its performance in the recent elections in Rajasthan, Madhya Pradesh and Chhattisgarh and earlier in Bihar, the Congress may present a better show than expected. Besides this, it may use the opportunity to strengthen the Congress organisational base in UP where it has only nominal presence in some districts. The SP and the BSP both have experienced that they have not been gainers in the company of the Congress. The SP learnt this lesson by tying up with the Congress during the 2017 assembly polls when the two parties won 47 and seven seats, respectively, despite working as hard as possible with Akhilesh Yadav's name openly being mentioned for extensive infrastructural development seen during his tenure as head of the government in Lucknow. Of course, the crisis within the SP also affected its performance in the assembly polls, but the truth remains that the Congress failed to influence its core voters to side with its alliance partner. 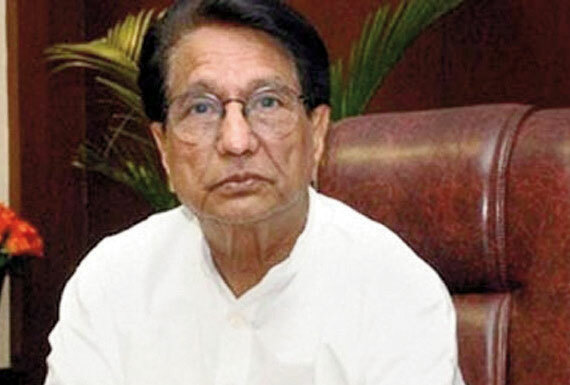 The BSP had such a bitter experience in 1996 when it contested the assembly elections by forging an alliance with the Congress, losing the polls with a tally of 67 and 33 seats respectively. Contrary to this experiment, the SP and the BSP fought the 1993 elections together in the aftermath of the gory happenings at Ayodhya in 1992 and captured power in UP with an impressive score of 109 and 67 seats, respectively, out of the total 422 in the state legislature. The SP and the BSP are, therefore, upbeat not only because of the declining appeal of the Narendra Modi-led BJP but also owing to their encouraging experience in the nineties. They are confident of influencing their supporters to vote for an alliance partner with little difficulty in such a situation. This is the "correct arithmetic" Akhilesh Yadav talks of in the context of the SP-BSP-RLD alliance, providing an indication that the alliance may be in the company of the Congress after the poll results are out. During the 2014 Lok Sabha elections the SP, the BSP and the RLD together secured 42.65 percent of the votes polled when the SP-Congress alliance proved to be a disaster and the BSP's performance was quite dampening or its supporters. As against this, the BJP and its allies got 43.3 per cent votes polled. The crushing defeat suffered by the BJP in last year's byelections in Gorakhpur, Phulpur and Kairana convinced the SP and BSP leaderships that the ruling party at the Centre no longer remains in a position to repeat its 2014 performance. The BJP is in trouble because it has little to present as its achievement in concrete terms during Modi's rule. The crushing defeat suffered by the BJP in last year's by-elections in Gorakhpur, Phulpur and Kairana convinced the SP and BSP leaderships that the ruling party at the Centre no longer remains in a position to repeat its 2014 performance. The BJP is in trouble because it has little to present as its achievement in concrete terms during Modi's rule. It has no convincing answer to explain away the suffering of the common man after the ill-advised demonetisation decision and the jolt given to business activity after the introduction of the GST (goods and services tax) regime. While these two decisions marred the Modi magic to a large extent, the death of children due to the oxygen shortage in a Gorakhpur hospital, inefficient maintenance of law and order which got highlighted by hate crimes indulged in on various pretexts and the disappearing job opportunities for educated youngsters dented the BJP image considerably. The Yogi Adityanath government's poor performance has sent across the message that the ruling party in the state as well as at the Centre has abandoned the development agenda which was its USP during the 2014 elections. 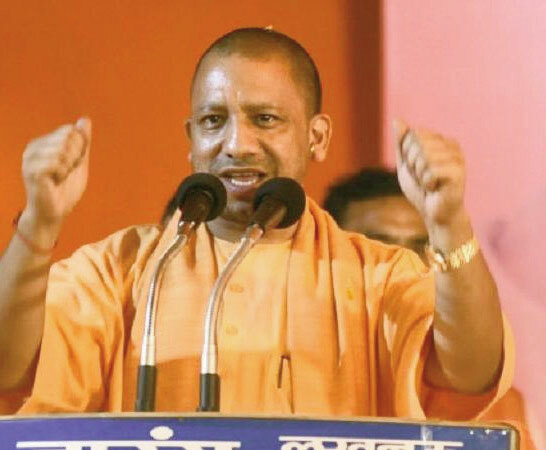 Yogi Adityanath The Yogi Adityanath government's poor performance has sent across the message that the ruling party in the state as well as at the Centre has abandoned the development agenda which was its USP during the 2014 elections. With a view to ensuring better performance in the coming elections, saffron party managers tried their strategy of communal polarisation by using the Ram Mandir issue but without success. The higher judiciary has provided enough indications that it cannot allow anyone to use its decisions to make political capital. Interestingly, the Modi government too has made it clear that it cannot prefer the ordinance route to satisfy the wishes of some Sangh Parivar outfits as it may get blunted by the opposition. In any case, people of UP are sick of the Ayodhya issue. They want the governments in New Delhi and Lucknow to remain focused on development as the state has been left far behind by other states in the race for economic advancement. Issues related to "roti, kapra aur makan" plus law and order appear to be influencing the thinking of the people more than anything else under the changed circumstances.